Slow As The South: Record Obsessed - Record Stand Upcycle and Expanding Record Collection. Record Obsessed - Record Stand Upcycle and Expanding Record Collection. Growing up, my parents had a large record collection. We often listened to records while cleaning the house on Saturday mornings. I can still recall the smell of Klean n' Shine ... (Remember Klean n' Shine when Florence Henderson (Brady Bunch) did those commercials long before she did the Wesson Oil commercials?) I remember my favorite record albums back then were Heart's Dreamboat Annie, Juice Newton, and the soundtrack to Grease. 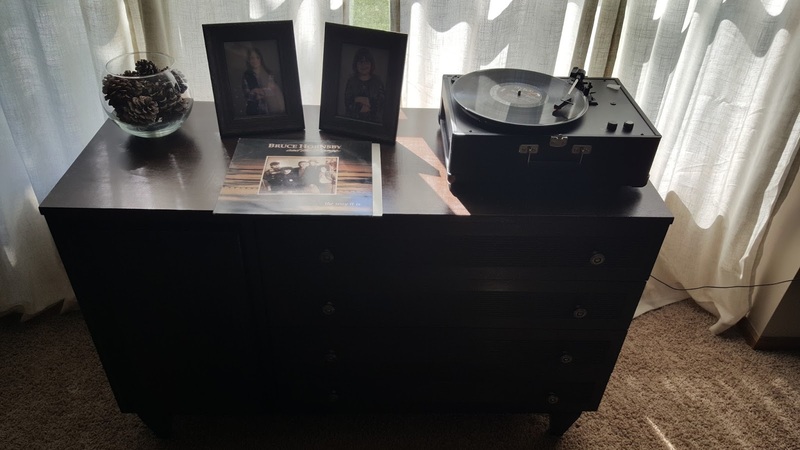 The first larger gift I gave my husband back when we were dating was a record player. He and I often talked about how much we missed the sound of records and thought it would be cool to own one again. I actually had previously owned a stereo system with a record player but it was stolen from my old house when it was burglarized along with several records. The record player that I got him back then and that we still own now is a Crosley record player with a removable lid. It isn't the greatest player but works. 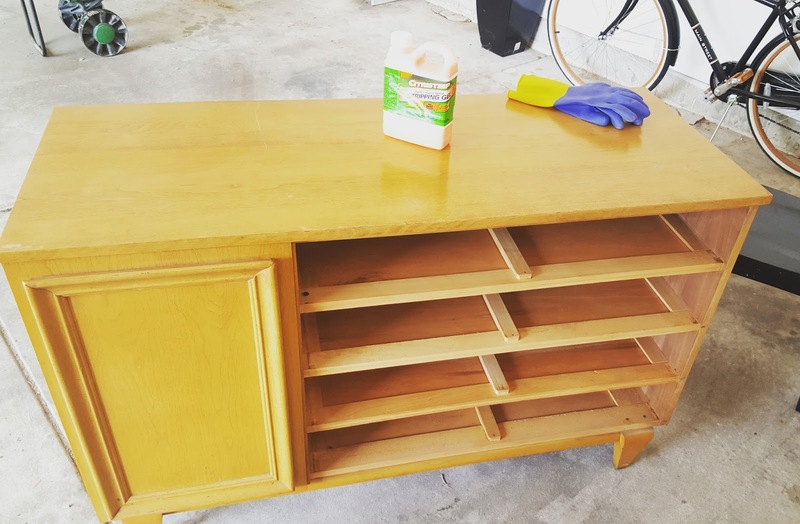 I had decided around the same time, several years ago that I wanted to restore an old buffet that I bought at an antique mall. We decided that it would make a great record stand because it has a door with tall shelving that is the perfect size to put records and allows them to stand up on end. Over Labor Day weekend, I finally started my restore project. To be honest, my husband has been harping me about it for years and now that he has an arcade room in the basement, he wanted it out of there. The buffet itself was in great shape, the color was just not so appealing. A light mustardy yellow paint that while very retro, didn't match my décor at all. I used Citri-Strip to remove the old finish. I had never tried Criti-Strip before but it worked quite well. It just took a plastic scraper to pull off the paint after letting it sit for a few hours. I did have to go back across the buffet and strip it a second time but I let the chemicals do most of the work. My husband sanded it for me to get it nice and even work out some nicks that were there prior. To stain it, I used a staining gel. I've stained things in the past with gel and always had great results so I didn't doubt my choice this time. I definitely made the wrong choice. My furniture is all very dark so I chose a walnut color to match. 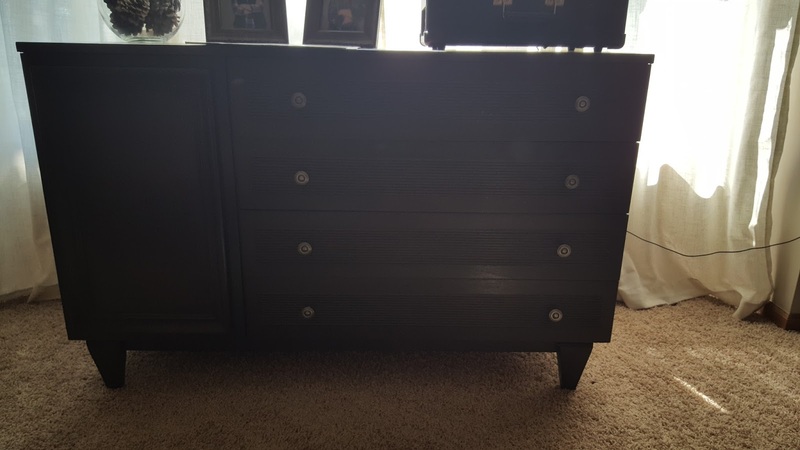 The color itself was very nice but the number of layers it took to get it dark was a lot and the stain was so thick that it ran down the sides of the furniture. It was definitely a pain to work with. I think I ended up with 4 coats and still wasn't completely satisfied but in the end, gave up and went with what I had. To be honest, unless you are right on top of it inspecting for flaws. it is hard to see the imperfections but believe me, there are plenty of them. I also replaced the hardware with some more modern knobs that matched the stain. Over this last weekend, we moved it inside and put it in it's permanent home in our formal living room. The record player has been relocated and we even tried it out on Saturday night while we played 90's Trivial Pursuit. We will probably store board games in the drawers or maybe my old CD collection which has all been moved to flip books over the years. We have been working to add to our record collection in anticipation of the completed stand. 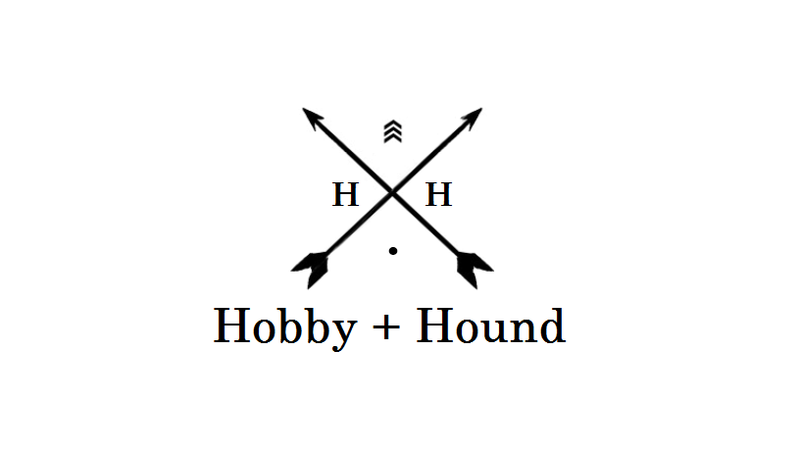 A store that we both love in a nearby town, Hastings, is going out of business. We hit their closeout sale and got some records 50% off and others I ordered online. 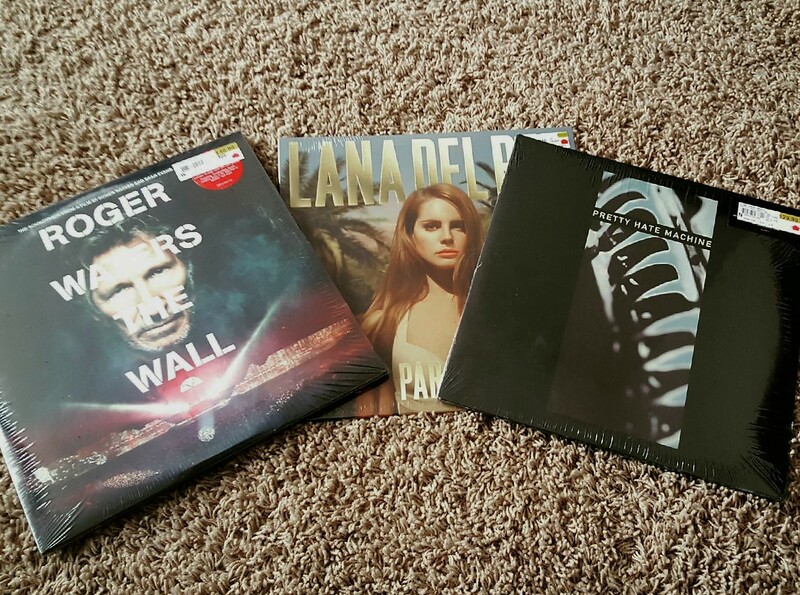 My haul so far is: Lana Del Rey, Nine Inch Nails - Pretty Hate Machine, and Pink Floyd - Roger Waters The Wall. I have a couple of others coming in the mail soon. I definitely will be replacing my old favorites like Dreamboat Annie. That's actually a pretty easy sell because I am pretty obsessed with the band Heart and have followed them for years.